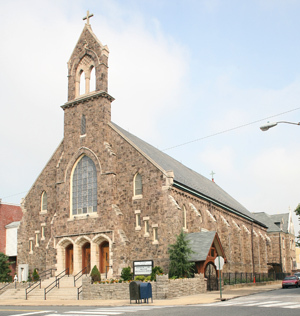 St. Leo Church, was has served as a worship site of Our Lady of Consolation Parish in Northeast Philadelphia since the parishes’ merger in 2013, will be closing. Three Catholic churches in the Archdiocese of Philadelphia will be closed after the official announcement Dec. 2 that Archbishop Charles J. Chaput has approved their relegation, or change in canonical status. The worship sites, which included churches and other buildings of parishes that closed years ago following mergers, are located in Philadelphia and Chester County. The three churches are Our Lady of the Holy Souls in North Philadelphia, which merged into Our Lady of Hope Parish at the former Holy Child Church site in 1993; St. Stanislaus Kostka in Coatesville, which merged into St. Joseph Parish in Coatesville in 2012 and St. Leo the Great Parish in the Tacony section of Philadelphia, which merged into nearby Our Lady of Consolation Parish in 2013. The formal request to close the parish worship sites originated from the pastors of the three parishes together with their parish pastoral and finance councils, according to the archdiocesan news release. The requests were then reviewed by the Archdiocesan Council of Priests and then presented to Archbishop Chaput who, after a careful review of all supporting factors, made the final decision. In the language of canon or church law, the churches are “relegated to profane but not sordid use.” In this sense “profane” simply means not ecclesiastical use, and sordid speaks for itself. The archdiocese does not object to them being converted into worship sites of other faith communities or housing, but certainly not into night clubs. As in the case of all parish mergers, the surviving parish receives the assets, including property of the closed parish or parishes. It is also responsible for any debts of the closed parish, for example loans from the archdiocese or back payments of diocesan assessments. Very often when a parish is closed, a limited Mass schedule is maintained for a time at the closed church, if practical. Funerals and in some cases baptisms may also be celebrated until such time as upkeep costs are not a burden. In many cases these upkeep costs are offset by the sale of the other assets of the closed parish. The surviving parish may also bring some of the furnishings or artifacts such as statuary into the surviving church, and it receives the proceeds from any items that are sold. Beautiful stained-glass windows from Philadelphia have found a new home in many churches around the country. Our Lady of Hope Parish has striven to keep the Our Lady of the Holy Souls Church building in good repair, but it is itself a poor parish with a debt of about $460,000, according to the archdiocesan release. It was assisted in this by rental of its school to Cristo Rey High School, but that $290,000 rental is scheduled to end at the end of the school year when Cristo Rey moves to a new location. At this time anticipated necessary repairs for Our Lady of the Holy Souls is approximately $160,000, which Our Lady of Hope does not have. More often than not, in cases where a closed parish church remains as a worship site, it is upkeep that causes the ultimate closure. St. Stanislaus Kostka, a former Polish national parish, had $26,010 in maintenance costs for the parish buildings in fiscal year 2016-2017. More recently $6,240 in plumbing bills was added and an estimated $30,000 would be needed for boiler replacement. St. Joseph Parish itself had a fiscal year deficit of $42,000. It is hoped a future sale of the St. Stanislaus property will put St. Joseph Parish on firmer financial footing. When St. Leo Parish merged with Our Lady of Consolation, an Italian personal parish, the newly formed Our Lady of Consolation became a territorial parish with St. Leo’s former boundaries. Although Our Lady of Consolation benefited from the proceeds of the sale of St. Leo School and ultimately the parish’s convent and rectory, upkeep of the 19th-century church has been a strain. It cost $44,531 in 2016-17 and anticipated future repair costs are beyond reach of Our Lady of Consolation, which itself had a deficit of $158,000 that year. It is believed a possible sale of St. Leo Church will restore financial stability to the parish. There appears to be a long process to close a church, as detailed in the beginning of this article. Do any churches get saved in this process? Is there any part of the process where someone refutes the information presented? It always appears to be about money. In New Testament times everything, finances especially, were shared. So St. Paul would ask one place he visited, that had money, to help a poorer place. Can this sharing be done in our own day? So wealthier parishes tithing 10% to poorer parishes. I’ve prayed at both parishes, read their bulletins, and find a real inequality. It reminds me of the inequality between the rich of our nation and the poor. It’s wonderful to see the Archdiocese in the black but part of the recovery was done on the backs of the poor. The nursing homes were sold to for profit companies so the level service is down. The cemeteries were leased for ninety-nine years to a for profit company and the prices were greatly increased. The closing of these churches makes it difficult for some to get to attend Mass and participate in the life of the parish. Finally I like to know where is the evangelization? Reaching out to welcome new people to church and fallen away. Blessed Advent to everyone. Priests, bishops, cardinals and the Church hierarchy generally bemoan the decline in Mass attendance. What do you expect when you close churches? Instead of the Church shepherds generating the importance of worship to the Lord God our Father in Heaven and the importance of the Holy Sacrifice of the Mass they reduce the opportunity to attend Mass. Tomorrow is the feast of the Immaculate Conception and priests celebrate one Mass on a Holy Day of Obligation. Where is the love to worship the Mother of God? Farewell to a great building, Our Lady of the Holy Souls. Many great memories of Faith and Family. My mother, Ms. Mildred Harrington, started the kindergarten at Our Lady of Holy Souls in 1966. She continued to teach there until about 1974-75 when she moved on to Our Lady of Mercy. My mother taught for the Archdiocese for over 30 years! Why does St. Stanislaus Kostka in Coatesville need a new boiler? Both the Church and the rectory had brand new boilers installed in the last 10 years.The newest was for the church it was converted from fuel oil to gas.